And with those words, one of Russell Crowe’s most familiar and most famous characters came to life on this day when Gladiator was released in U.S. theaters on this date in 2000. The American Film Institute ranked Maximus at #50 when it came to their 100 Heroes and Villains list (#1 is Atticus Finch of To Kill a Mockingbird). 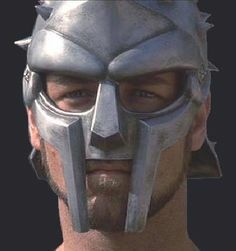 Maximus placed twelfth (#12) in Total Film’s list of the fifty best movie heroes and villains and ranked thirty-fifth (#35) in Empire’s 100 Greatest Movie Characters. Maximus was so popular, that when the ‘Australian Legends’ issued their postage stamps series, Russell Crowe is portrayed in the role which pushed him to worldwide stardom. Gladiator is also credited with reviving the old ‘sword and sandal’ movie genre, which is a tad ironic considering that one of the films blamed for destroying the genre had a similar storyline. We’re speaking, of course, about The Fall of the Roman Empire, which has been discussed here on several occasions. Thanks to Gladiator, other historic epics were green-lighted: Troy, The Alamo, King Arthur, Alexander, Kingdom of Heaven, Robin Hood and 300. Of all these, your Keeper’s favorite is 300 for numerous reasons. Kingdom of Heaven and Robin Hood were both directed by Ridley Scott. Russell Crowe starred in Robin Hood and bowed out of The Alamo. Budgeted at $103 million USD, the Dreamworks/Universal Studios release went on to make over $457 million worldwide, and it is still in the list of the top twenty R-rated movies of all time (2016’s Deadpool went to number one a few days ago). Released to mostly positive critical acclaim (because let’s face it, ‘haters going to hate’), Gladiator was nominated for twelve Academy Awards, winning five including Best Picture, Best Actor in a Leading Role (Russell Crowe), Best Visual Effects (Neil Corbould, Rob Harvey, John Nelson, Tim Burke), Best Costume Design (Janty Yates), and Best Sound Mixing (Ken Weston, Scott Millan, Bob Beemer). It is one of the few Oscar nominated movies to win Best Picture while the nominated Director (in this case Ridley Scott) lost. In addition, it won four BAFTA Awards (best film, best cinematography, best editing, best production design) and two Golden Globe Awards (best motion picture – drama and best motion picture original score). With an original score by Hans Zimmer (who was nominated for an Oscar) and Lisa Gerrard (who, due the stupid Oscar rules at the time, couldn’t be nominated), the movie starred Crowe, Joaquin Phoenix (nominated for Best Supporting Actor), Connie Nielsen, Oliver Reed (in his final role), Derek Jacobi, Djimon Hounsou and Richard Harris. Based on a story by David Franzoni, the Oscar-nominated original screenplay was written by David Franzoni, John Logan, and William Nicholson.